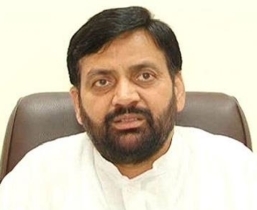 Ambala: Haryana Minister of State for Labour and Employment, Nayab Singh on Monday launched the ‘Sharamik Panjikaran Abhiyan’ in the state. The Abhiyan, which will continue till July 31. The labour registration campaign has also been launched at about 55 labour chowks in the state followed by distribution of identity cards to registered labourers. In the first phase of the campaign, labourers would be registered at all labour chowks followed by registration at the construction site and in the last phase labourers would be registered by visiting villages, Singh elaborated. He said that Haryana Building and Other Construction Workers’ Welfare Board has been running 24 schemes for registered labourers. The Minister said that canteens have been opened under ‘Antyodaya Aahaar Yojana’ at districts including Sonipat, Gurugram, Yamunanagar, Faridabad and Hisar to provide quality food to labourers at Rs 10 only. Under the second phase of this scheme, such canteens would soon be opened in other districts Panchkula, Ambala, Panipat, Karnal and Bhiwani. Keeping in view the interests of the labourers and their children, the present State Government has distributed about Rs 400 crore to registered labourers through different schemes during its three-and-a-half years tenure, he concluded.